I’m flying home from England as I write this. Last night was only the second Rugby match I’ve attended. Same team, but seventeen years separate my two experiences. The team (belonging to the Rugby League – not Union) is named the “Warrington Wolves,” but from what I saw the team would be better represented by the “Ox” mascot. I thought American football was rough! 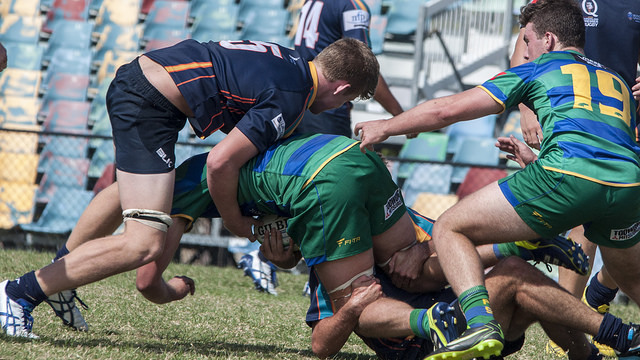 Rugby players wear no helmets, nor pads. One player did wear some kind of head protection, possibly due to a recent injury. Certainly the exception. I used to think Rugby involved dragging players to the grass, but I’ve changed my mind. There’s no less tackling than what you would see in the NFL. I asked my friend, Andy, who kindly invited me to the game, how well these players would do in the NFL. Then we envisioned together how well Seattle Seahawk’s Marshawn Lynch would do playing this sport. We laughed, picturing him rushing the field dragging with him five opponents to the end line. So this blog is about what I could blog about from watching a Rugby match. This is for you, Andy. Well, I could begin by trying to understand why in this sport several coaches, along with water boys, rush in and out of the game offering instructions and water, – all of it during the active play. Their agility to avoid tackling matched that of the players. I’m tempted here to parallel this with what happens, or should happen in the church – you know the scene – of “coaches” rushing in to give support and encouragement to those on the front line of the battle, and others running in to give a refreshing word, and an encouraging push to keep going. Or, I could describe to you the rules of the game, very similar to our football. Sort of! Rather than four downs to make ten yards, Rugby League gives you six tries to go as far as you can. It’s a fast paced game with few breaks or timeouts. They’re given only ten minutes for a halftime. The players are relentless. Tireless! (They would collapse if the young men did not come to their aid from the sidelines with those water bottles.) Makes me think of some of you who are unstoppable in your commitment to reach the finish line, tireless and relentless in the pursuit of a singular goal. A goal that can only be summed up by one word. We play for a bigger prize, of course. The kind you don’t forget about a day or a week later. This is the final prize. The finish line our eyes are locked on. We don’t quit after four tries to make ten yards, nor six to make the whole field. Refusing to let go of what was handed off to us by Jesus, we hold tight to it. We press on toward the high call. We fix our eyes on Jesus, the Author and Perfecter of our faith. We strain ahead encouraged by the cheers of that great cloud of witnesses who never gave up, because, for them, and now for us, winning is non-negotiable. What about the crowd? 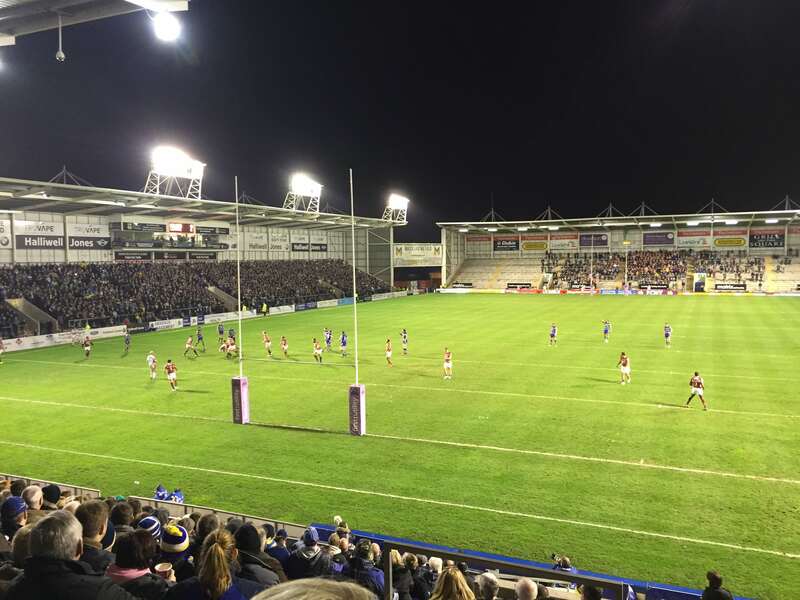 Not the eight-thousand rooting on their home team, the Warrington Wolves. I’m talking about the several hundred sectioned off in the “away fan” area, pinned as dwarves shadowed under the intimidating thousands who sat, and stood on both sides of them. They’re undeterred by the home crowd. The home crowd cheered some, yelled more while their team remained behind for the entire game. (Sorry for the loss, Andy). But, it was the small number, on the far end, -in the sectioned off area – that caught my attention. They sang, chanted, and drowned out the home crowd. Their team, the Huddersfield Giants, ironically came into the game as underdogs. In this matchup it was their spirit that reached Giant like proportions. They reminded me some of the small number of “us”. We don’t amount to much in this world. Sectioned off in our own corner, our existence seems oddly small next to the imposing presence of the rest of the world. Yet, we’re the ones who seem to have something to sing about. There’s always something to sing about when you’re winning. Wherever I travel I meet small number of fans whose singing seems at times to drown out the cry of those around who don’t seem to have much to sing about. Like the small group of believers who meet together in the town of Warrington, England, where I preached last week. Three men lead this body. They’re the ones who rush in and off the field, cheering, encouraging and refreshing those who run tirelessly with the gospel. Holding a firm grip to what they believe. Andy is one of them. It’s not easy worshipping, living, serving and loving as a small community where what you do is viewed as old-fashioned and irrelevant, sometimes even received by mocking laughter. I know. I used to serve here as pastor to these “fans of Jesus”. But, the singing goes on. 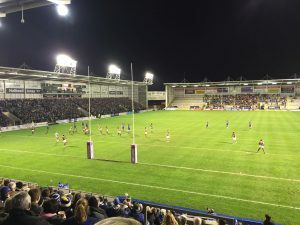 To my dear friends in Warrington – you who sit as “away fans” under the shadow of the imposing presence of the world that surrounds you – your relentless commitment to keep a tight grasp to the gospel, handed to you by Jesus, will one day be rewarded by a final whistle, and one long-loud cheer the sound of which will never, ever, diminish. Keep pressing on my friends! It’s worth it! So, that is my blog about what I would blog about from a Rugby match! Next Next post: A Blog: Hope Birthed in Hardship!